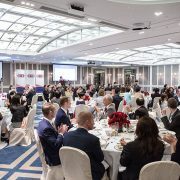 The American Chamber of Commerce in Taipei held its 51st annual Hsieh Nien Fan banquet on April 10th in the Grand Ballroom of the Grand Hyatt Taipei. Opening the evening, AmCham Taipei Leo Seewald delivers remarks commemorating the 40th anniversary of the Taiwan Relations Act. The act has special significance for the Chamber because the organization played a key role in drafting the legislation exactly 40 years ago. Good evening! I’m delighted to welcome all of you to the 51st annual Hsieh Nien Fan of the American Chamber of Commerce in Taipei! This year’s Hsieh Nien Fan is particularly significant because, as you have heard in the videos, it also coincides with the signing into law of the Taiwan Relations Act on exactly this date 40 years ago. I understand there is also party commemorating this event in Washington DC in just a few hours, so if any of you are looking for a good after party, you might be able to make it if you catch tonight’s flight out. In the meantime, for those who do not know, the Taiwan Relations Act (TRA) forms the basis of the U.S.-Taiwan relationship and has helped create stability for Taiwan to prosper. It is the legal foundation that has made possible four decades of ever-stronger ties in such areas as trade, investment and an extremely broad range of cultural, educational, and scientific cooperation. 1978 and 1979 was a defining period for the American Chamber of Commerce in Taiwan as the Chamber stepped up and played a key role assuring continuity by advocating for a stable, secure relationship between the US and Taiwan. A bit of history… The initial draft TRA legislation was too vague, so the then-AmCham chairman, Robert Parker, made several trips to Washington where he testified before Congressional committees. He called for a clear statement of American commitment to Taiwan’s stability, as well as assurances that the substance of the bilateral relationship would be maintained despite the change in form. 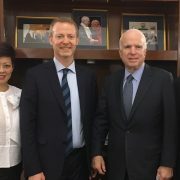 Among the many scholars and other experts who also testified, Mr. Parker – on behalf of AmCham – was the main voice of the business community, stressing the importance to American businesses of being able to operate in an environment of security and certainty. Thankfully, the final version of the TRA addressed those concerns. Can you imagine a Taiwan without A-foo’s taxi? And who would still be playing Air Supply? In any case, again AmCham stepped forward, taking the lead in ensuring new arrangements were made to preserve these institutions for future generations. 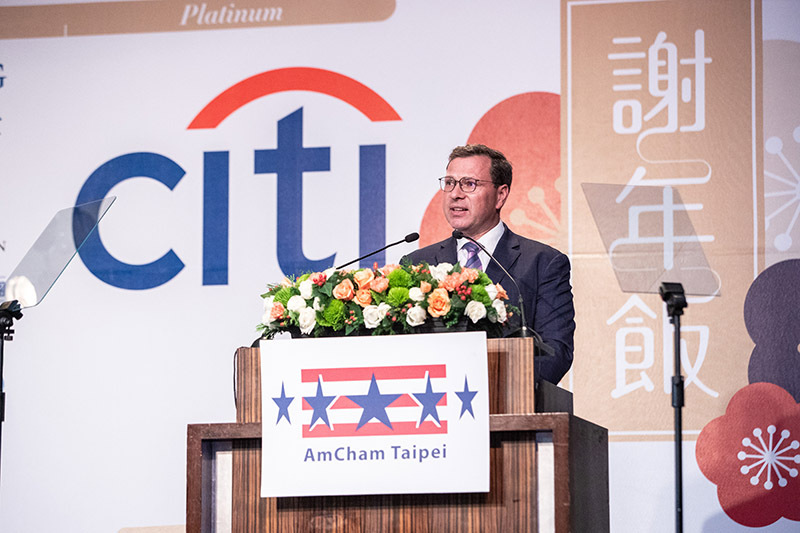 That period in 1979 was an example of AmCham stepping up to protect its members and the stability of Taiwan and was certainly one of AmCham’s finest hours… but it’s not the only example of the Chamber taking on big issues and playing an important part in Taiwan’s history. 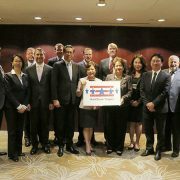 The central theme for AmCham has always been (and will continue to be) the stability and prosperity of Taiwan. We often make the point that the success of our members is inseparably tied to the success of Taiwan. 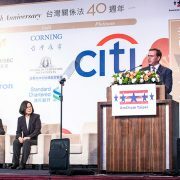 Most of our members have been operating in Taiwan for more than 20 years- in fact, this year marks the 55th anniversary for Citibank, the 50th for 3M, 35th for HSBC, and 30th for both Microsoft and Cigna, as examples. It is in this spirit that we cooperate with the Taiwan government to help suggest areas of improvement. Last June, when we launched the 2018 Taiwan White Paper, we were very pleased to be able to announce that a record number of issues from the previous year’s had been resolved. This year, with a few months still left in the White Paper cycle (and before election fever grips the country) I hope we’ll again have a very productive outcome -but there’s still some work to do! It is important to note that last year’s white paper success could not be achieved without the strong partnership the Chamber has built up with Taiwan government officials at all levels. 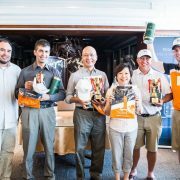 Our Hsieh Nien Fan is our chance to say thank you to the many members of the Taiwan government that we’ve worked with over the past year – and to let you know how much we appreciate the excellent cooperation you’ve given us. 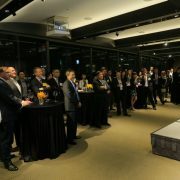 Given our legacy and dedication, AmCham stands ready to offer our support for Taiwan through what now appears to be another period of dramatic change. Supply chains are shifting, climate-change issues demand attention, and disruptive new technologies – everything from cloud computing, 3D printing to the digital economy– are rapidly transforming the way business is done. The companies AmCham represents are world leaders in driving innovation and as Taiwan confronts the challenges of this new technology-driven economy, the Taiwan government should know that it has a steadfast friend and supporter in the American Chamber of Commerce. Finally, and most importantly, as the AmCham business climate survey points out, our members believe Taiwan has a bright future and we are all on the same side to make that happen! With that thought, I would like to thank President Tsai, for joining us once again as our keynote speaker. It is always a pleasure to have you with us and we appreciate the determination that you, Premier Su, and the other members of the Administration have shown in ensuring that Taiwan remains a vigorous part of the global economic community. Ladies and gentlemen, please join me in welcoming her Excellency, President Tsai Ing-wen to the podium….